Jane Hunter was among the first to see the immense potential of Marlborough, the northeast corner of New Zealand’s south island, as a wine-producing region. Together with her late husband Ernie, Jane established Hunter’s Wines in the picturesque Wairau Valley in 1983. Since its inception, Hunter’s Wines has produced wines of distinctive and outstanding character. 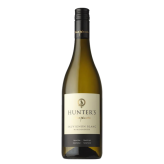 The fruit flavours and pure, fresh style of the acclaimed Hunter’s Pinot Noir and Sauvignon Blanc create a lasting impression. Both fulfill Jane’s guiding principal: to create consistent, quality wines that are also extremely good value. Jane has won national and international acclaim for her contribution to the New Zealand wine industry. Hunter’s wines have won more than 60 gold medals in national and international competition: the 1991 Sauvignon Blanc achieved unprecedented honour by winning a gold medal and the Marquis de Goulaine Trophy as “The Best Sauvignon Blanc in the World” at the 1992 International Wine & Spirit Competition. In 1995, Hunter’s Wines claimed the inaugural Black Diamond Award at the 1995 InterVin International Wine Competition, an honour awarded to the winery with the most gold medals in competition. After 30 years in the business, Jane was inducted into the New Zealand Wine Hall of Fame in 2013. In 2016, she was awarded with Wine Marlborough’s Lifetime Achievement Award for her contribution to Marlborough wine.